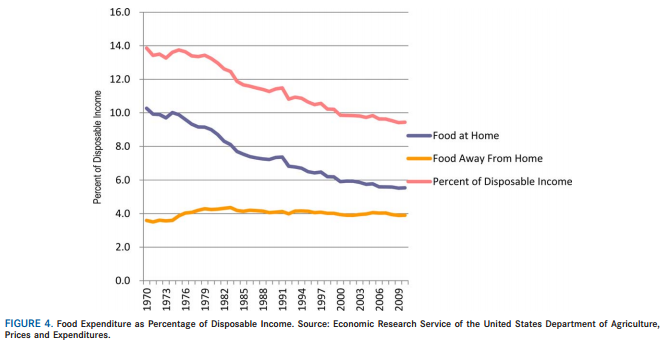 Chart of the Week: Is food too cheap for our own good? As you scarf down burgers and potato salad this long Memorial Day weekend, consider this: Americans have the cheapest food in history, and that unprecedented abundance is largely responsible for why we’re so fat. And even as the real cost of food goes down, each dollar we spend buys us more calories than it used to. The average American’s total caloric intake (adjusted for spoilage and other waste) rose from 2,109 calories in 1970 to 2,568 calories in 2010, according to U.S. Department of Agriculture data — the equivalent of an extra steak sandwich every day. Little surprise, then, that more than 78 million U.S. adults, or 34.9%, were obese in 2011-12 — more than twice the rate found in a 1976-1980 health survey.